​"Tomorrow's Another Day" sung by Terri and Jay (Terri Soland ('62) and Jay from Robbinsdale is now on YouTube. Thanks to Suzy Doss-Bicknese ('61) for the link. If any of you are not listed on this site, and would like to be, please Click on the Classmates link to Add Your Profile to the site. Adding your profile will allow your pictures to be displayed along with your name. You will be choosing your own secure user name and password. Your information will be uploaded immediately. We will add your class picture to your name. You will be able to add your 'now' photo. If you would like to turn off the music, click on Music below. The music band will come up top left. Click on the ll on the right, and it should stop. Our 55th Reunion was a Great Celebration! Pics can be found in the Photo Album section. Many thanks to Barry Fox for the pictures. A few additional ones were taken by Karen Stenback and Dee Oxell Lynch. 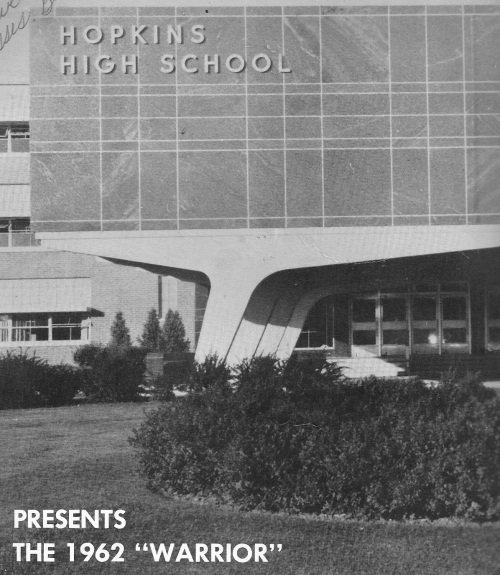 Hello Classmates of the Hopkins High School, Class of 1962! and "pretend" we are young again.